Let T.Webber improve your water pressure with our innovative DAB Systems! Low water pressure problems aren’t unique to just well systems. Sometimes, Hudson Valley homeowners on municipal water struggle with poor water pressure, too. 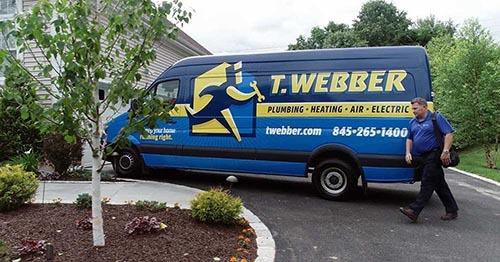 Whether you are on a community well, are the last house on the street, or just aren’t getting the water pressure you want – call T.Webber. Our Plumbing & Pump Experts can help walk you through your options – and help you achieve the water pressure you want and need for your household. All of our low water pressure service calls begin with a complete diagnostic of your water system. In the event you don’t have any plumbing issues (leaks, corroded pipes, etc), our Service Experts may recommend the installation of a DAB System to help improve your pressure. What is a DAB System? A DAB System is an integrated system for water pressure boosting in residential applications. Who is a DAB System suited for? Homeowners on municipal water and/or community wells that want to improve their water pressure. Want to walk through our options of how to get great water pressure? Call T.Webber today! Our technicians are already in your Hudson Valley neighborhood.